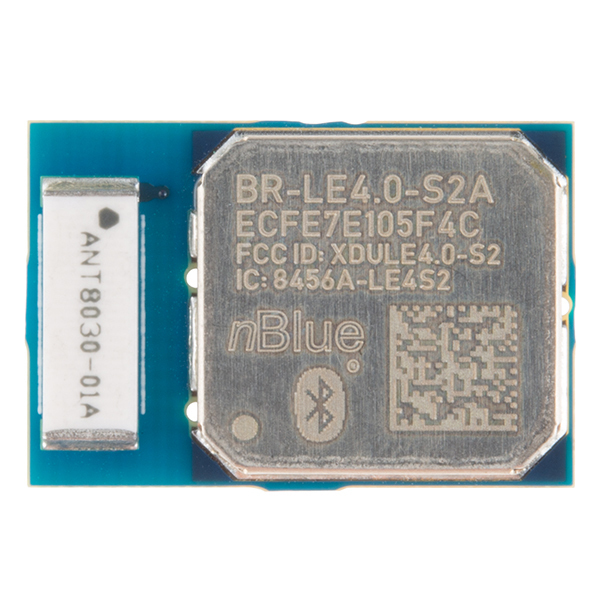 The BR-LE4.0-S2A is a standalone Class 1 Bluetooth 4.0 module that requires no firmware or external components. Custom client applications can be written directly onto the module, which supports both analog and digital peripherals, eliminating the need for a second microprocessor. Alternately, the BR-LE4.0-S2A can be integrated into an existing design as a HCI network processor device, with a host processor running the core application and the BR-LE4.0-S2A providing Bluetooth low energy communications. 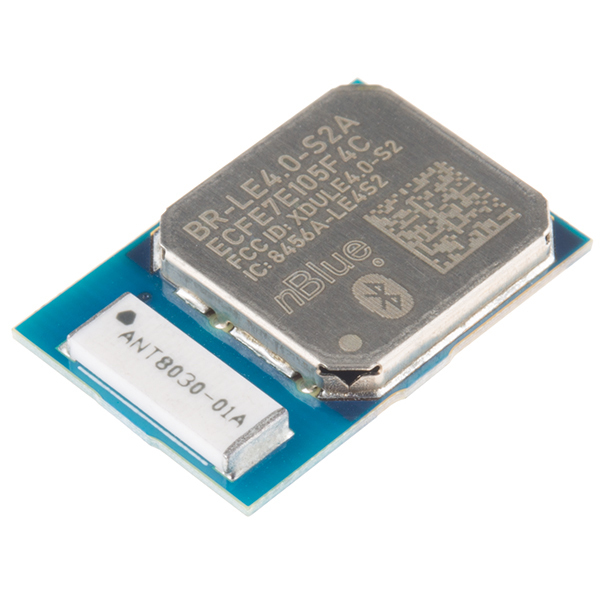 The BR-LE 4.0-S2A module is equipped with an integrated antenna and is able to run Bluetooth protocols and profiles at low energy and power consumption (2V - 3.6V and 31mA). 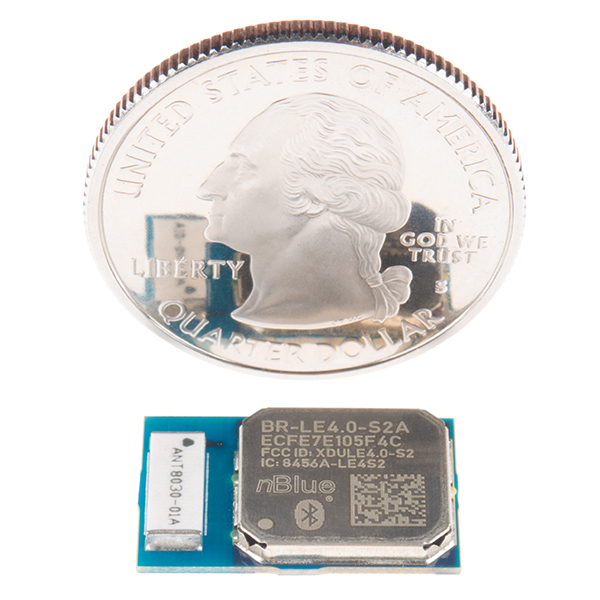 Each BR-LE 4.0-S2A utilizes the TI CC2541 SoC with 256K Flash (8K RAM), a maximum communicating range of 100m line of site distance, a maximum data rate of 3Mbps, and a frequency band of 2.402GHz to 2.48GHz. 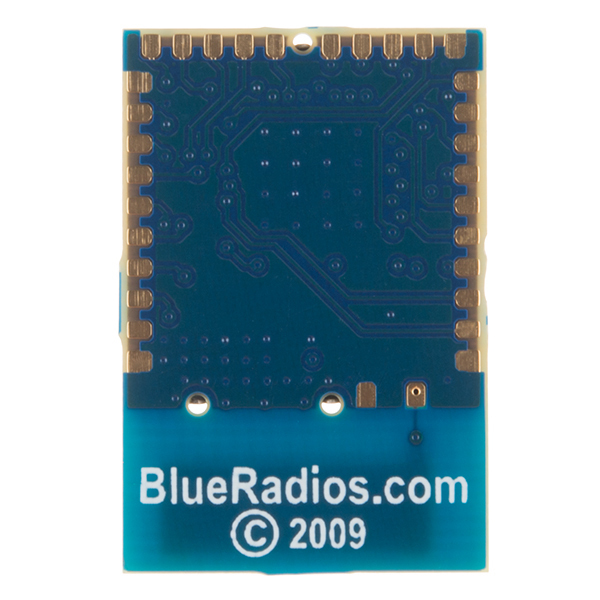 Note: We received these Bluetooth 4.0 modules for a wireless board we ultimately decided to scrap. Therefore, we wanted to at least give you, the customer, the opportunity to use this BR-LE 4.0-S2A in whatever application you'd prefer! Once this module is sold out we will not be ordering it again, get it while you can! I have been using (8) these BR-LE 4.0 chips for about 4 months now. They seem to be very flakey. I have been running Vcc on them at about 2.8V via VMultipler chip. The Voltage may drop down to 2.0-2.4V once in a while though (with Batteries going dead). The chips seem very often to drop their Bluetooth connections (I am using them to connect to Android). But, this may be the Vcc Voltage drops (they drain a Lot of Current for the Batteries). Worse than that though, is that I have lost (6) of my (8) BR-LE4.0 chips altogether. Usually this happened in only about 1 week of the chip's usage. They would start losing connections - and just get worse over a few days, until they Fail altogether - and never work again. The Vcc Voltage never got above 3.0V. The Micro Projects ran fine, and I replaced the Batteries, Connections were fine. But, I could never get the chips up again. Maybe the Voltage drops caused this ? Anyway, this seems mighty sensitive for a chip of voltage level (being Low damages the chip ?) to me. I feel like I'm missing the link to the AT command references. I am blind today or is it hidden? Nevermind, found it: you must provide proof of purchase and log in to their forums. http://www.blueradios.com/software.htm for more info. Not blind... I can't find it anywhere either. These old 8051 based TI modules are useful if you are happy with the built in software. That's fine if you just want a wireless serial port to another processor. If you need anything beyond this limited functionality it requires the $3000 tool chain to access the proprietary SDK. This not a I rules police issue. It is a major limitation which isn't mentioned in the listing. I didn't figure this out until after I bought a bunch of them from a different vendor which are now useless to me. The reaction you are seeing is from people who have been burnt. Why is this a ding and dent? The note on the description indicates that they intended to use this on another product that they ultimately didn't create, so this isn't a ding and dent so much as it's just being sold wholesale and as-is. This responds partialy to the main question : Why ? Why is this board with the chip on it not being created ? Has anyone who has purchased one of these successfully signed up with their forums? This product looks interesting but the documentation is only available to customers with an invoice from a distributer. I'm not sure they will consider Sparkfun to be a distributer. Standard Bluetooth Low Energy profiles supported: Embedded Bluetooth Stack Protocols and Profiles (Master/Slave) include: GAP, GATT, SMP, ATT, L2CAP, BAS, BLP, BLS, DIS, FMP, ANP, HIDS, HOGP, HID, HTP, HTS, HRP, HRS, IOP, IAS, LLS, PASP, PXP, SCPP, SCPS, TIP, TPS, and BRSP. I cannot get access to BlueRadios forum because Sparkfun is not an authorized distributor. Does anyone have an AT Command for this? How can i get the schmatics of it? Anyone can help please? Does anyone have a link to a list of the AT commands this module supports?! The summary spec sheet (linked above as the "datasheet") makes no reference to API, nor does the product page. Edit: AT command reference is only available to registered members... see http://www.blueradios.com/software.htm for more information. You'll need to provide proof of purchase. I can't help wondering what the product was. I'm guessing a controller for LED arrays. Currently I am using the RedBearLabs nano which uses the Nordic ARM based chip. It is a little more expensive but I can use my choice of 3 different development environments including Arduino, mbed and raw C/C++ with Nordics freely available SDK. TI clearly realized their mistake which explains the new ARM based offering with true open source support. Meanwhile this board is not useful for a maker on a budget (I.e. no $3k) who needs to customize the firmware for standalone use. It is a great BLE peripheral for an Arduino. It should only be sold that way. Not true. These devices come pre-programmed with an serial command set that allows you to access them like most other Bluetooth modules we stock. In fact, that's the very first bullet point on the datasheet, linked above. This is confusing... To control, one can use the AT command stack, but this does not allow one to reprogram it. Yes? Yes, you can control it via AT commands. If you want to write your own firmware for it, you may need the IAR compiler (I haven't dug into that, as that's outside of our intended use case), but for general purpose use with an Arduino or other embedded system, you can control it via serial commands. It is definitely not only usable by large companies with large budgets. "Custom client applications can be written directly onto the module, " Hmmm... This definitely talks about programming and not simply control. "Can be" not "must be to use". Of course you can reprogram it. That's true of every module on the market. I'm not sure why this particular product has pulled all the rules lawyers this morning, nor why everyone feels compelled to argue with the guy who spent several weeks working with this product about what needs to be done to work with it, but it's pretty plainly spelled out in the datasheet, as linked above. "Iâm not sure why this particular product has pulled all the rules lawyers this morning..."
Probably because they're clearly getting a rise out of you. The first two sentences talk about uploading your own code, which would make me think that was the expected / primary way to use it. You're right that nearly all devices like this can have new firmware uploaded. The fact that you highlight that feature first would lead me to believe that it was more practical on this module compared with other ones. Personally, I usually shy away from writing my own firmware because of $$$ or tedious to configure toolchains. Generally, I expect the SparkFun descriptions to describe what a moderately competent person can do with a device with normal effort. I go to the data sheets to read about what I might be able to do if I feel up to being ambitious. This one is the opposite. The description starts by telling me what hard, complicated stuff I might do, but if I read the data sheet I learn that I can just wire it up to an arduino and start having fun.